Let’s face it, modern technology has us spoiled. Remember when we used to have to text using just the numbers on the keypad? Remember when all TV was standard definition, and we enjoyed it? Well, times change, and so do the standards of consumers. That’s why the new Summer Infact Wide View 2.0 fits so well with todays trends. The high quality video and the large screen size are just what the doctor ordered. No more squinting to make out the picture or dealing with small postage-stamp sized screens, the Wide View 2.0 is just that, a wide view. Now, that’s not all thats important about a video monitor. When we evaluated this model for our top picks of the year, it made an honorable mention. It doesn’t include all the fancy features of some of our top picks, but it nonetheless deserve mention as a very solid product which presents a pleasant experience when using it. Wide Angle Lens – As mentioned above the main standout feature is the wide angle lens. 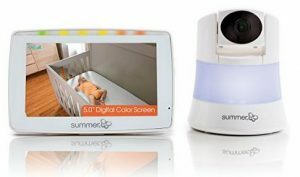 It allows a larger view of a room (the manufacturer claims you can see up to 4 times as much room area than a regular lens), which can be helpful when trying to monitor a room with 2 or more cribs, or a playpen areas where children move around. Multiple Cameras (Sold separately) – This model can be connected to up to 4 separate cameras to monitor additional rooms or spaces. 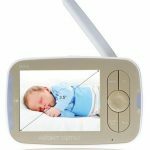 (Keep in mind that cameras are generally not interchangeable between Summer Infant models, which is unfortunate when trying to upgrade from a previous purchase). Large Monitor Screen – No one likes needing a pair of glasses just to make out the image on the monitor screen, and this model takes care of that with its large 5 inch screen and its clear LCD screen. No Remote Pan/Tilt – While you can do a remote zoom with this model, it doesn’t allow for a remote pan/tilt of the camera. While this can be somewhat made up for by the fact that the camera angle is so wide (you don’t need to pan much if you can see the whole room), it doesn’t account for times when a camera is dislodged (or moved by a smart toddler looking to hide from their parents). No Temperature Sensors – We must be getting spoiled, but the lack of temperature or humidity sensors is a downside to this model. With other competition offering it on their monitors, it’s unfortunate that it’s not included in this one. No Music – While does allow for the “talk-back” feature of its intercom, it doesn’t have music or lullabies included. Many parents don’t utilize this feature anyway, so it may not be a huge negative. All in all, this is a very solid model that will fit nicely into your routine. 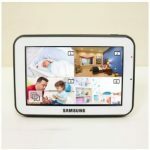 It’s a very good option if you have multiple cribs in one room (such as for twins, triplets, etc) and for parents who find smaller screens very annoying.